salary by jumping off the corporate ship to follow his passion. He was a big deal at Accenture and decided that he wanted more. He wanted to be a high school teacher. I speak pretty often…. Craig speaks to high school “audiences” every day. In Sept. 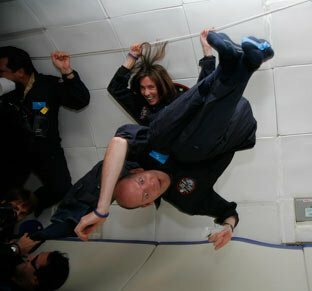 I had a chance to go on a parabolic flight to experience weightlessness – the same type of flights that NASA uses to train astronauts for weightlessness. This week, I finally received the photos and videos from the event. Attached is one of the better photos of me being “weightless”. got together in early Sept to design some experiments showing the effects of weightless. The flight was on Sept 18. It was basically an all-day event, but the flight was only 90 minutes. We flew out of San Jose over the Pacific Ocean. Somewhere in the middle of nowhere, the plane started doing these crazy roller-coaster-like hills – climbing at a 50-degree angle then putting the engines in neutral and letting Earth’s gravity pull us through a parabola. We did that 15 times and got about 20 seconds of weightlessness each time. It was a phenomenal experience! before, if I needed another reason to be a science teacher, that was it. My students all got 2 days of weightlessness discussion – 1 the day after the flight and another when the videos came in. I also got to keep the flightsuit so I wore that both days to school and on Halloween. My pal Craig worked hard, made extremely tough choices, and in the end found his passion; he’s found his home. I’m proud of him…and am inspired by him. But never more than when he sent this photo. My point: Are you following your passion? Are you making sure that fun is driving you? That you are driving fun? Can you find “great reasons” to be doing what you are doing? PS. I want a flight suit too, but I’m afraid I’d barf all over the place on my way to earning it. Wheels in Your Feet? Heck Yeah!